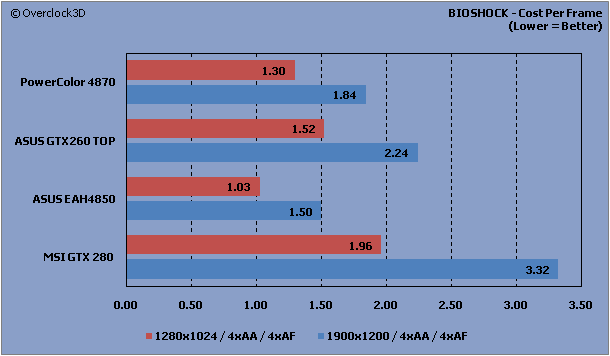 Sitting just 10fps behind the GTX280 and 4fps behind the GTX260 at a resolution of 1280x1024, the HD4870 shows that is certainly a good choice for the low-resolution gamer. However, once the resolution is increased to 1900x1200 the HD4870 - even at overclocked settings, isn't able to keep up with the numbers pushed out by the GTX200 series. Moving these results over to our CPF scale reinforces our findings. 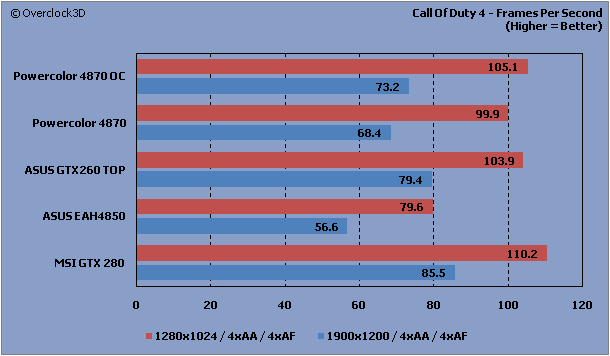 At 1280x1024 the HD4870 works out to be around £0.20 cheaper than the GTX260, but once the resolution is increased to 1900x1200, the GTX260 actually makes up for its slightly higher price by producing some decent fps figures which bring the CPF value of the card to £0.05 below the HD4870. BioShock is a recent FPS shooter by 2K games. Based on the UT3 engine, it has a large amount of advanced DirectX techniques including excellent water rendering and superb lighting and smoke techniques. All results were recorded using F.R.A.P.S with a total of 5 identical runs through the same area of the game. The highest and lowest results were then removed, with an average being calculated from the remaining 3 results. 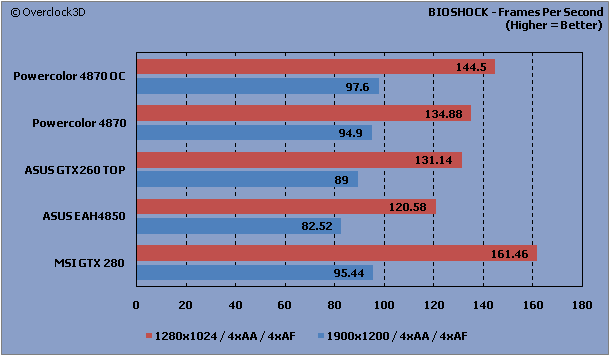 BIOSHOCK shows the ATI cards some serious love with the HD4870 actually coming within 0.5fps of the GTX280 at 1900x1200. Things get even better for the card when our overclocked settings are applied, with the 4870 managing a 2FPS advantage over the GTX280 and an 8fps advantage over the GTX260. 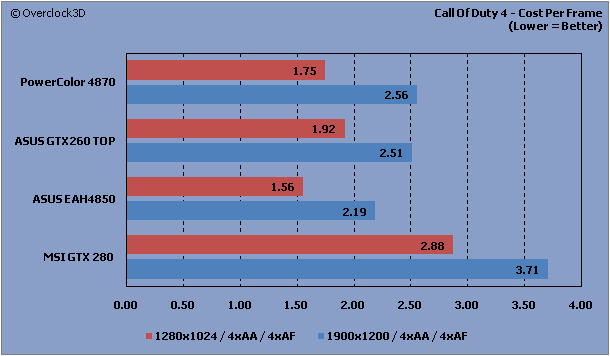 For obvious reasons this translates extremely well for the HD4870 when placed on the CPF scale, with the card managing to come in a full £0.40 cheaper per frame than the GTX260 at 1900x1200 and £0.22 cheaper at 1280x1024.